Buy Both Books for just $30! Most households in the Western world have more cameras than cars or cellphones or rutabaga. (Unless of course, you actually grow rutabaga.) But, unlike most other household items, the camera is actually one of those things sitting around the house that you can make money from without having to sell it. (You can't say that about rutabaga!) And that's where these two books come in. They (the books, not the rutabega) will tell you more about the current world of the photography businessand how to make money in itthan any cookbook can tell you ways to chop rutabaga. The category list on your left is a list of chapters that you can read right now. Once you do, you'll want to order your books now, to save $15 off the list prices! Why TWO books, not one? Simply put, there's just so much content, that one book isn't enough. "Profitable Photography in the Digital Age" covers more topics in more extensive depth, strong enough for the pro, but gentle enough for the beginner. The other book, "How to Make Money with Digital Photography" is like a coffee table photo book, rich in full-color images, and focuses on making money without abandoning your friends and family. The age of the internet and digital technologies has had a more dramatic effect on how business is done than any other event in the history of photography. Whether one shoots film or the latest digital camera, the nature of marketing, selling, and competing in the photography world has gone through such a fundamental shift, that even one's attitude about business has required rethinking. As the costs for production and distribution of images go down, the supply has boomed, reshaping the photography industry at every level. The challenge with today's market, however, is that the nature of the business didn't just change, it expanded to include new market segments, plush with new kinds of photographers and buyers alike. 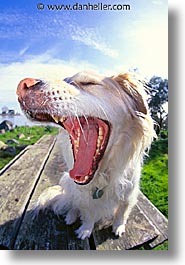 Even at the consumer level, anyone with a camera has found opportunities to sell pictures. No matter what degree of participation someone wants, there is now a much wider variety of ways into the photo business than ever before, so there is no longer a "one size fits all" paradigm for how photo businesses are started, run, or grown. These are not how-to books on setting up and running a photo business of any one specific kind, or even an internet-based one. Instead, they help you understand how things work, so you can decide on which of various business approaches are right for you. There is no secret to succeeding in photography, though there are many paths to choose from. In fact, the same approach may work very well for some, while resulting in disasters for others. This is why these books deconstruct many approaches and many perspectives and identify those conditions when any given strategy is effective...or when it's not. The reader will learn how to think smartly and analytically about the bigger picture, giving a more useful context for how to work within this industry. Whether you're only considering a career in photography, or are ready to take that big leap into the realm of owning and running your own business, these books explore realistic perspectives on what to expect and how to gauge your own aptitude for making it in this highly competitive arena. If you've been in the business a while, but find that things are either static, or slowing down due to unforeseen pricing pressures, this book will help you find new strategies for diversifying revenue streams and adding new sources of income. Insert Sappy Marketing Phrase Here! 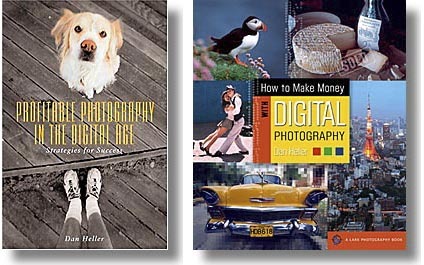 Existing photo business books were written by photographers who were successful before the internet and digital imaging. Thus, they never needed to start new careers in this new domain. Instead, they migrated to and "adopted" the internet as part of their existing business models. Most of their revenue is still derived from a residual revenue stream drawn from a well-established network of clients, sales channels and other sources that are still entrenched in the traditional model. While there is nothing wrong with this, per se, it is not helpful to an emerging photographer for learning how to build a new career. In fact, the advice in existing books can even cause more harm than good. Existing material focuses on the "mechanics" of business, not strategies. The tasks, the forms, the procedures, and all the things you "do" to run a business isn't "advice," it's a to-do list of items; they won't teach you how to be successful. My books engage in in-depth analysis of all aspects to business, examine a variety of approaches, challenge the presumptive business models, and look beyond the photography world for wisdom. By studying the broader general business environment through economic data and research studies, the reader will gain better insights into those models that yield greater success: volume sales, strategic alliances, aggressive marketing, competitive pricing, and most important of all, the awareness that someone else can come along with a cheaper, less expensive product that the customer deems "good enough" for their business needs. We then apply these models to the world of photography. Most authors of other books on the photography business are photographers with little or no experience in other business sectors. Because the nature of the photo industry has evolved to one where heavy competition defines the business climate, who better to get advice and knowledge from than a successful internet technology entrepreneur who understands (and can explain) the paradigms involved. While pro photographers with long resumes and impressive clients are respectable for what they've done, teaching how to evolve in today's market requires a foundation in the business climate shaped by today's paradigms, not yesterday's. All other books on the photography business discuss the basic nuts and bolts of starting a business, or in using certain tools. None address the issues of growing or expanding an existing business, improving inefficiencies, or migrating from a weaker photo business to a stronger one. There is an assumption that existing pros don't need (or won't take) advice from others. Yet, with the fundamental change in the business climate, many pros have few resources for learning new ideas to replace (or enhance) their existing practices. I got my degree in Computer Science in 1985 from the University of California, Santa Cruz, and worked in the computer industry until 1990, when I founded a company called Z-Code Software. My product was the first commercially available email system designed for the internet. (Before then, internet email was non-commercial and not used by the general consumer public. And commercial email wasn't compatible with the internet.) As the net became mainstream in 1993, everyone from consumers to suppliers rushed into the market, which immediately filled with competing products. Yet, our small, sales-funded company of 45 people still managed to win accounts over the big players like Oracle, Lotus, Microsoft and every other competitor in the market, including start-ups with millions of dollars of venture capital funding. This remained the case until I sold the company and changed careers to one that's more "lifestyle friendly," photography. My foray in the internet age was the basis for my knowledge and experience in a highly competitive business context. So, when I got into photography, I simply applied exactly the same business models that I used in the tech world. In two years, my business grew to a point that isn't seen by most pro photographers for ten to fifteen years. 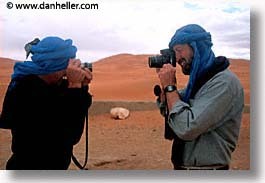 What's more, I ended up with what just about everyone in the photo industry said couldn't be done: I had a profitable travel-photography business where virtually all revenue is derived from online sales. All that, and net margins that would make even a software company envious. Best of all, I did it with a modest initial investment not much different than what any hobbyist would spend on reasonably good camera gear and travel. Despite my success, it seemed that others in the industrypros and amateurs alikewere struggling. To me, it was so clear what the problem was: the paradigm about how to do business wasn't up to date with modern realities. And that problem stems from an archaic business model that pros and educational institutions continue to promote. Such business models were based on historical practices from the pre-internet era when the photography industry was very different. It's not that such advice was "wrong," it just doesn't apply today like it used to. Unlike those days where a powerful portfolio and a good agent or agency were the path to success, the photo industry evolved the exact same way that the business side of the technology sector did: barriers to entry fell, causing buyers and suppliers to rush in. Traditional sales channels and supply chains for photography are changing exactly the same way technology did in the early 1980s when it became cost effective to actually own your own computer. A photographer can now do more for himself than his agency could do for him because he's leaner, faster, and more versatile, able to shift to new directions or respond more quickly to customers and changing market needs than any agency can. Once photography and the distribution model for selling direct to photo buyers opened up, the photography business has taken a fundamental shift as never seen before. 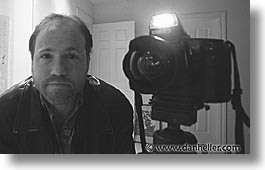 In response to the lagging educational paradigms pontificated by the various entities within the industry, I wrote in 1997 the first of a series of articles on the basic "truisms" of the photography business since the internet. This lead to more articles that, individually, attempt to correct the misunderstandings that permeate the collective thinking. These articles have become the basis for my book, which you see in the index at the top of this page. The business climate for photography is still evolving, especially as the transition from film-based medium to digital continues to inch forward. As a consequence to this and other evolutions of legal and economic conditions, my articles have been "fluid" over time, undergoing revisions as the industry matures. Hence, my material is not only the result of my own experiences, but those of others, who for years, have given me feedback on their experiences as well. In the end, this book has become the most current and comprehensive on the subject today. No animals were harmed making this book!